Commercial and multifamily mortgage originations are expected to close out 2018 at roughly the same level seen in 2017, according to the Mortgage Bankers Association (MBA). MBA projects that commercial and multifamily mortgage origination totals will hit $532 billion, just over last year’s record volume of $530 billion. Multifamily mortgage originations are expected to increase 7% this year to $251 billion, and originations of multifamily mortgages are expected to rise 2% in 2019..
For brokers looking to ride this momentum and start closing small-balance commercial mortgages, now is a great time to get started. As long as you work with the right lenders and take the right steps to drive leads and submit deals, small-balance commercial mortgages are a fast and easy way to increase your business and your income. Do you have any questions? A deal you’d like us to review? 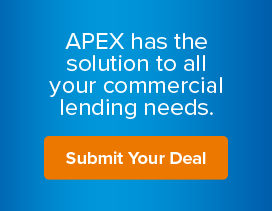 Give us a call at 877-604-5304 or submit your deal to learn more about how APEX can help.